Mini notebooks, netbooks, sub-notebooks, ULPC’s (whatever you want to call them) are great aren’t they? But as far as design goes, they tend to be a bit run-of-the-mill – i.e. plain. That’s what makes the Tokidoki mini laptop from Fujitsu such great eye candy, not to mention being a nice break away from the norm. 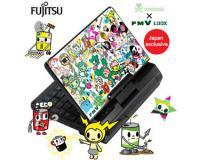 Completely covered in Tokidoki characters, this Fujitsu laptop is incredibly lightweight and uses a super low amount of power when compared to your average laptop, giving a firm salute to eco-friendliness too. It’s only available in Japan I’m afraid, but with the huge buzz currently generating in the US and UK, hopefully it won’t stay that way for much longer.